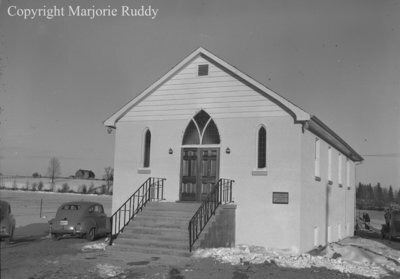 A black and white large format negative of St. Andrew's Presbyterian Church taken on December 8, 1949. In this view fields are visible in the background and there is a car to the left of the church. St. Andrew's Presbyterian Church was located in Pickering, Ontario. St. Andrew's Presbyterian Church, 1949, Marjorie Ruddy. Whitby Archives A2013_040_1147.